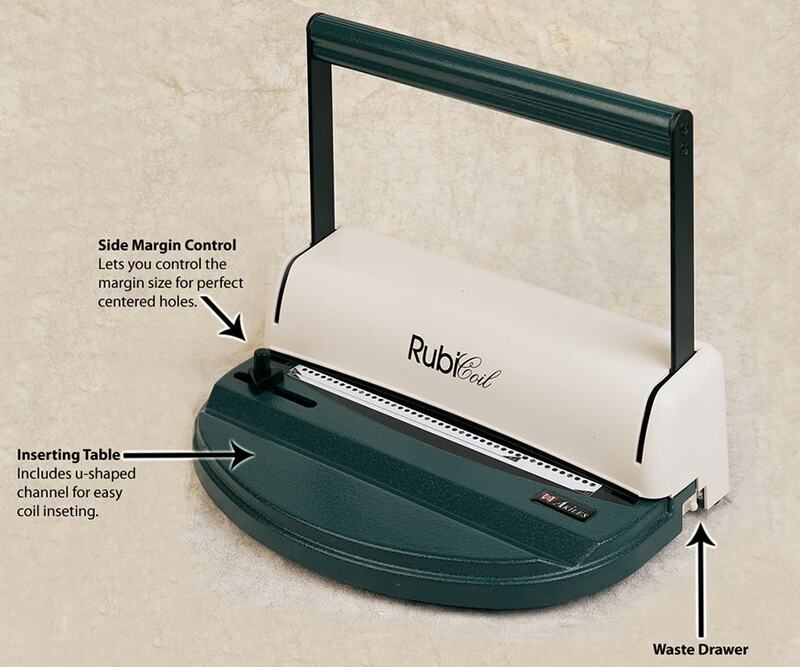 Personal and small office spiral binding users LOVE the Akiles RubiCoil spiral binding machine. They rave about the simplicity, and the surprisingly durable metal design. And how it can create perfect round holes all along the binding edge quickly and conveniently, especially as compared with manual punching methods that involve punching each hole individually or just a few at a time (often used by crafters and individuals). Combine all that with the affordability, and this little spiral binder punch is the best coil binding machine for individuals and small businesses with occasional binding needs. Learn all about this powerful little punch and how it is perfect for crafters, makers, DIY'ers, and small businesses in this in-depth look at the machine. I discuss the pros, and the limitations, that come along with this spiral punch, so you know whether or not it is a good choice for you. The RubiCoil is manufactured by a company called Akiles Products, Inc. They are known around the world for their high value machines that are made with quality, at an affordable price. They stand behind all of their punching and binding machines with one of the longer warranties on the market, outlasting even some very expensive equipment warranties -- a full 1 year limited manufacturer's warranty against defects. The RubiCoil is tiny - it fits perfectly on a desk or table while in-use, and is easily stored when not in use (if you choose to do so). It measures only 10" x 16" x 12" and weighs about 15 lbs. It is surprisingly robust, especially considering the price. Pay the same at a craft store, and you get a dinky machine made of mostly plastic. The RubiCoil, however, has heavy duty metal components, including the base, which adds stability. On the front of the machine is an indent. This is called the "U" channel and is used as a way for you to easily assist in rolling the coils into your punched pages. Trying to roll coil through paper on a flat table is difficult, as it catches every turn...but this specially designed table makes it simple. The RubiCoil has the strength to punch through paper, PVC and polypropylene covers, card stock, and more...just reduce the number of sheets you punch at a time (1 single sheet is recommended when punching thicker stocks and covers). It has metal chassis and high quality components guarantee durability and reliability. A single side margin guide helps you center your pages, and the holes are spaced perfectly for standard letter size pages that measure 8.5" x 11". The RubiCoil is user friendly, and completes your book quickly with a few simple steps. You just center your sheets with the side margin control and pull the handle to punch. Repeat this step for each small stack of sheets (max 6-10 pages of 20 lb. bond paper) until your book is completely punched (punch covers 1 at a time). Now tap your stack on the table to align the pages and slide it into the coil size selector I mentioned. If you are between sizes, larger is always recommended. Spin the coil in through the first couple of holes, then place the book on the inserting table and roll it in the rest of the way. The last step is to use some cutter crimper pliers (not included) to finish each end of the coils. Empty the waste tray frequently to avoid back-up into the machine and jamming. With the fully manual design, it is clear that one of the major limitations of the RubiCoil will be the volume of books it can handle. Because of the time it takes to make a book with this manual machine --the time to punch just a few sheets at a time until your entire book is punched, and then the time to manually roll the coil through the book pages, and finally, the time to manually cut and crimp the ends of the coil-- it is not going to be a good choice for individuals or offices that need to more frequently make coil documents. The punching capacity is also a bit mis-represented, in my opinion. The manufacturer rates it at up to 10 sheets of paper (remember, this is standard 20 # bond copy paper), but I find it works much better with a maximum of 6 sheets (and even better with just 3 or so). You will need to apply much less effort to punch, and it will not strain the machine as much (in the video above, you can hear how the punch pins squeak from the strain of higher quantity of sheets that was punched). The punching pins cannot be replaced on the RubiCoil, which means once they wear out completely, the machine will need to be replaced. There are some tips to keep your machine punching pins sharp and protected from wear, to help extend their life that you can apply to help them last as long as possible. That being said, with the intended volume for this machine, it will still last for years; we have customers from 5 years ago who are still loving their RubiCoil. The punching pins are stationary, and will always punch when you pull on the handle. Now this may not sound like a limitation on the surface, but what this means is that you cannot stop the RubiCoil from punching specific holes. This is only ever a "problem" when your intent is to work with books other than latter size 8.5 x 11, bound on the 11" edge, and can still be worked around. You may just need to do some special spacing visually, or simply deal with a partial hole punched on the edge of your odd-length books. Not a limitation, but keep in mind you will also need a pair of cutter crimper pliers to finish your coils. This machine will punch and help assist you inserting the coils through the punched pages. You will need these crimpers to cut the coil ends and crimp them in, which stops them from un-rolling out of the book.